Latest post 01-07-2012 6:13 PM by Søren Hammer. 30 replies. you might remember me posting about wanting to recap my 4400 a loong time ago. Now I finally have the spare time (sort of) to do it. Firstly, I think that this thread could be used as a general guide on dealing with these monstrous receivers. I thought it is strange that there apparently wasn't a thread dealing with the 4400 in details. 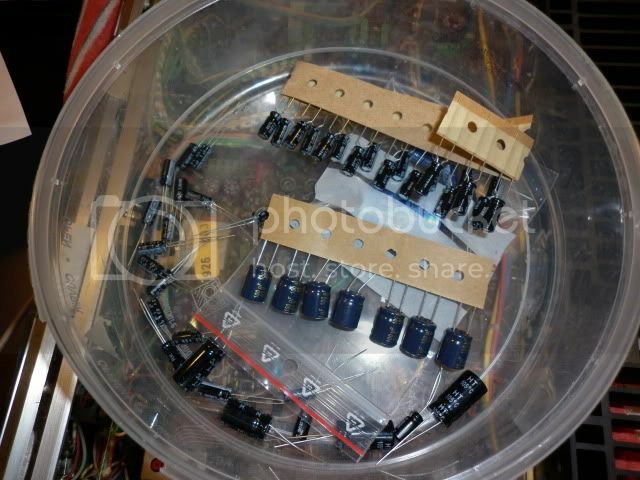 I have ordered the cap kit from Dillen (two in fact, as I also will restore my Father's 4400 after mine), it consists of nothing less than 56 discrete capacitors! This is just the preparation of the project, need to buy a new soldering iron tomorrow before the fun can begin. Any members who has good advice may post it here, have been wondering if I can remove the PCB's in the bottom of the unit to acess the solder side of the top PCB or should I work hard and remove the wiring looms? 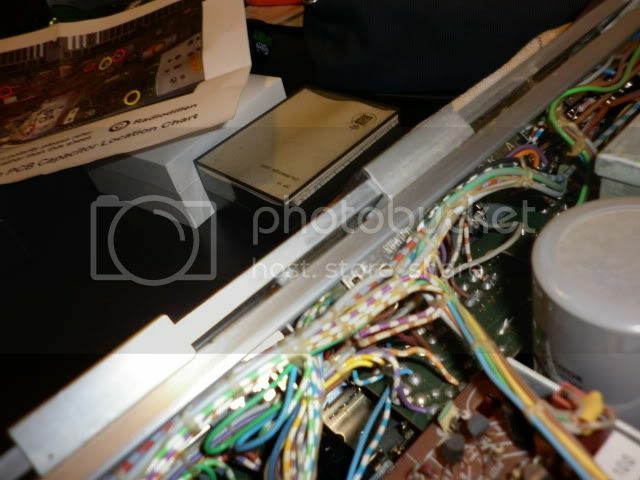 Beocenter 9300, Beogam CD50, Beocord 5500, Beomaster 3400, Beomaster 4400, 2 Beogram 4000, Beomaster 8000, 2 beogram 8002, Beovox S-75, Beovox MS150.2, Beovox RL6000, Beovox S-35, Beomaster 6000, 2 Beocord 9000, Beocord 8004, Beocord 5000, Form 1, 2x Beolink 1000, Beo4, MX3500, LS4500. Born 1993. Just removed exess dirt from the middle plate behind the control panel - over 30 years of dirt collected on a bunch of cotton swabs, the last part removed with 99% isopropanol. It's a little hard to take a good picture of the situation. Well done Søren, but you might want to dismantle the fascia completely to have access to the switches which you will have to clean thoroughly. 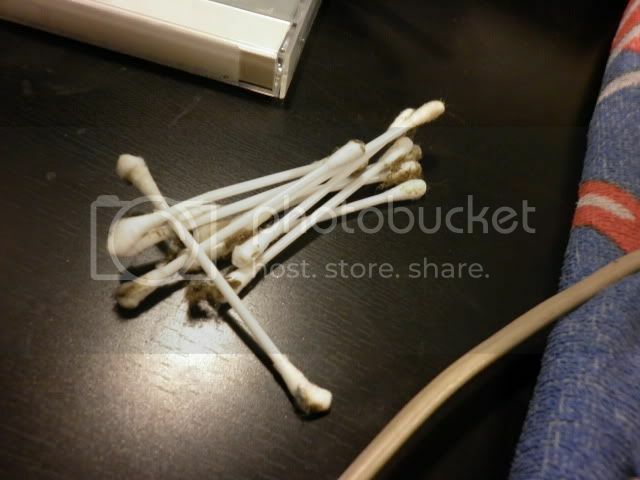 Then everything else will be much easier to clean (wash, even) sans Q-tips! That is actually a good idea, Chartz! That also gives better acess to the PCB, I think. The faders could very well also use a clean-up. Tried to power the unit on to be sure that it worked, last time I used it is around may. Pressed a random switch on the bank to turn it on. The "O. load" lamp briefly flashes and the protection relay steps into action. Something is clearly wrong, I must get it corrected before I begin to fit Dillen's set. The 4400 was handed over to a retired B&O technician, the problem turns out to be DC current leaking from one of the output transistors. Updates will come. Looks like a great project. Will you be doing the recap yourself, or has that been handed over to the Beo-tech also? I wish I could be recapping with you but I don't have any caps! Thanks for the interest of my project. 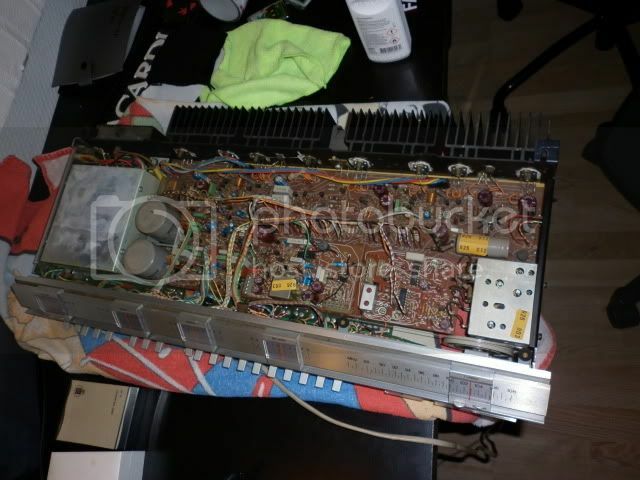 I will get the fault fixed, though I replace the capacitors myself. 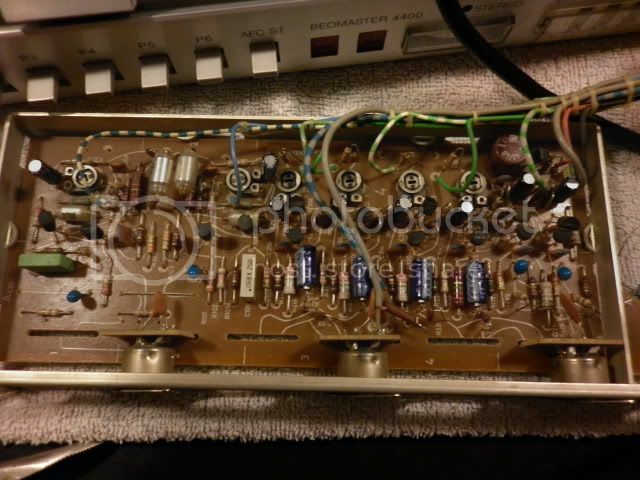 Funny enough, the tech stated that "only the brown caps need replacing, the blue Philips electrolytics should still be fine". Are there anybody here who agrees with that? My experience tells me that yes the blue Philips were reliable. Sometimes they are fine, rarely they dry out, depending on use. As coupling capacitors they don't fail. On my Beomasters they were generally still okay, but in doubt you might want to replace them and sleep on both ears! Me, in principle... but they are old, definitely already somewhat tired, and don't cost that much. You can't be sure without measuring them, which would mostly be wasted time as it won't take much longer to replace them anyway. 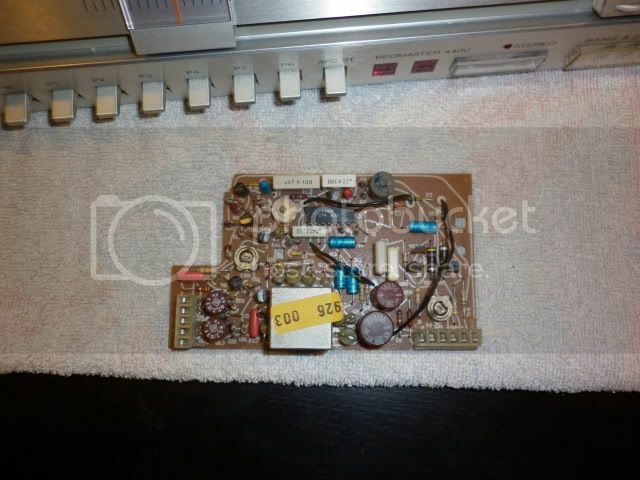 I'm generally against component replacement when there's nothing wrong with them, but as you've already found out, taking the Beomaster apart isn't a five minute job, and it would be highly annoying to do it another time because one of the "should be fine" components wasn't. 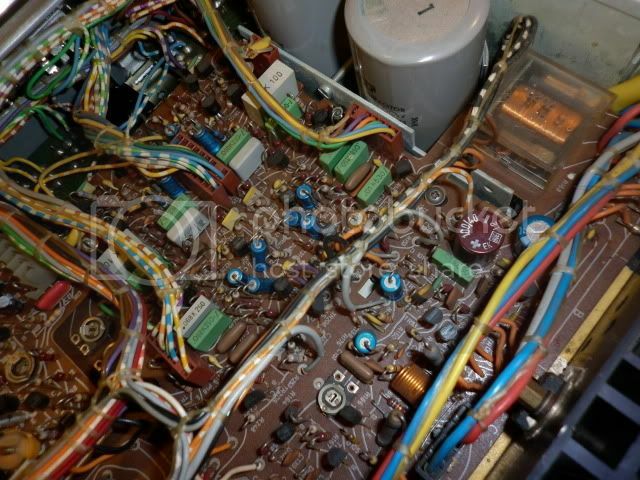 When the unit is open change all the e-caps, also the big ones, and the bridge rectifiers with some a little bigger, the big output darlingtons, if one is bad I change all of them, also check the thermal grease on the cooling elements, if dry clean and put on new grease. I have my BM 2400 now open for the 3rd time because I didn't "do it all". So dont leave anything where you have just a little doubt. 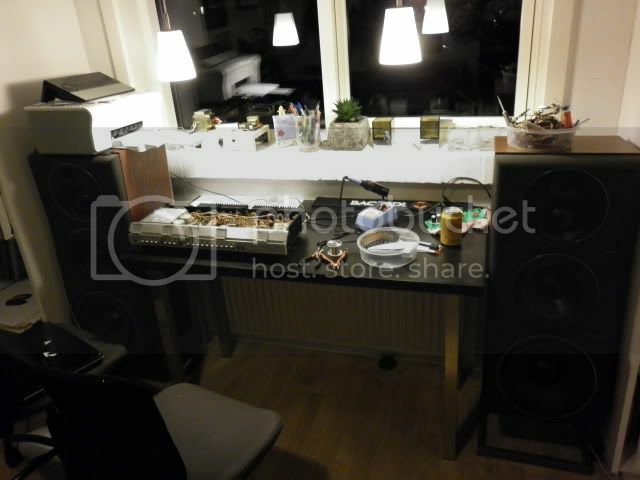 Beosound 3000, BL 4000, BL 8000, BG 2404,BG 5000, BG CD50, Beocord 5000, BM 901, BM 2400, BM 4000, BV S45, BV 3702. There is nothing we cannot do, but a lot of things we don't want to do!! Just got the 4400 back in business, it was ultimately proved to be a small signal transitor just before the output stage. It turned bad and one of the TIP transistors switched to put out DC. That's great Søren... now playing with the big boys! Congrats! What does it sound like then? It sounds fine, but I want it to sound like it did 30 years ago. Beginning to look at the PCB's and schematics and heating the soldering iron. Turning the Beomaster upside down and removing the bottom plate again, removing the four screws on the backplate besides the DIN connectors for Tape 1, 2 and phono. 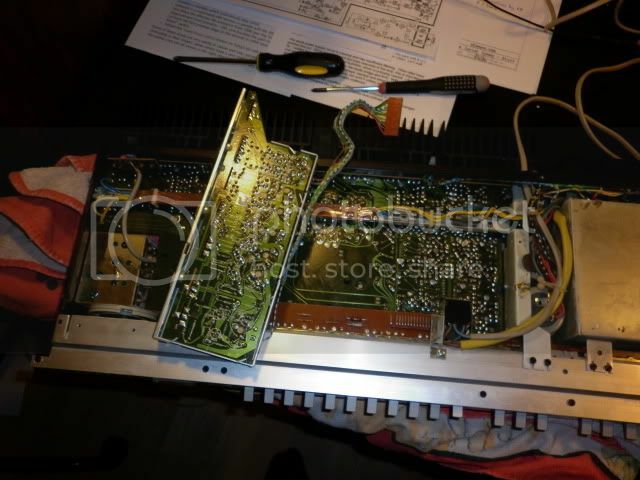 The whole module can then be removed, take care as the PCB connector needs to be unplugged before removal of module. 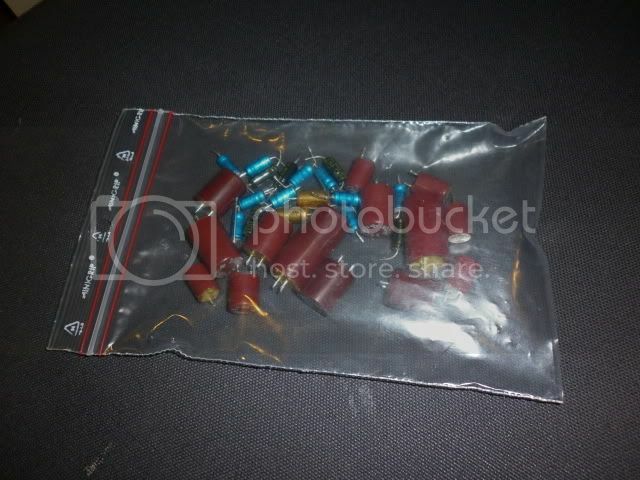 Then I was ready to unsolder C6, a red 220 uF cap, I prepared my tin sucker to do the job. Then I realized that it was broken. Bugger. Going to the electronics store for the third time this week tomorrow. No, its very nice of you to mension this, we all learn as long as we live. Keep them coming, its going to be a very good BM. Now in action, starting with the smaller module PCB's. The DIN connection module after firtting new capacitors - the 47 uF red cap replacement was not to be found in the kit. Starting on the two red caps on the FM board now. And please welcome me to the club of 4400 owners! Mine has a bad channel too it seems... waiting for the parcel to arrive! I will see if I have the time to make more progress tonight - a large social science report has stolen quite a bit of my spare time this week. And gongratulations with your 4400, hoping that the fault is easily fixable. My Father's 4400 just got the death scentence, the whole output stage, including small-signal transistors are gone unfortunately. Have been doing a bit of work on the 4400 now. 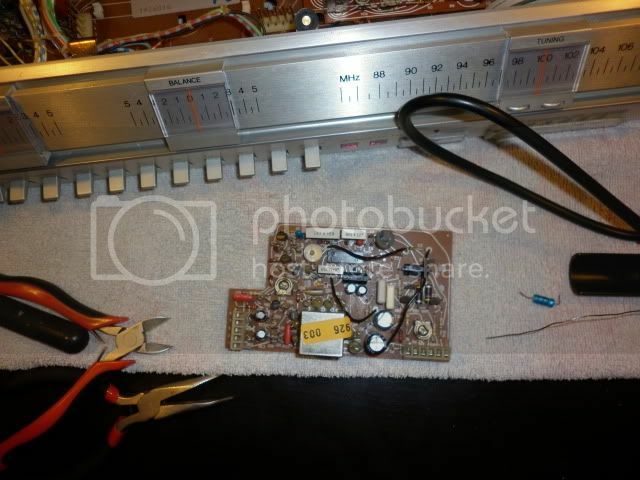 31 capacitors replaced, considering myself to be just about halfway done. Martin sent me a PM about the missing 47uF caps, he kindly offered to send them, free of charge. Now I move on to the more populated part of the main PCB, a bit tough to work around with. There are lots of 1uF and 2.2uF plus some 4.7uF in there. Has anybody tried 5mm Wimas in the 4400? That happens to me every week! Although not necessarily a social science project - I finished all of those last year! That's funny, same thing here! An MPSA06. For testing purposes, I tested with a less powerful 2N3904 just to see what happens and we were back into business! I'm waiting for the real McCoy now, plus the cap kit from Martin. I ordered five of them, and I intend to replace it on the other channel too, since they seem to be prone to failure! Strange, my repairman said he had never experienced that failure before, and he had been working as a radio mechanic for B&O 1975-2000.